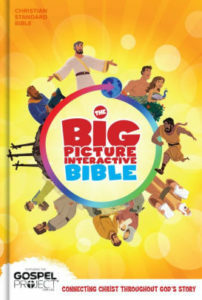 CSB Big Picture Interactive Bible. B&H Kids, 2017, 1350 pages. It’s the year of the CSB! The Christian Standard Bible debuted last year, but it’s actually an update of the Holman Christian Standard Bible, or HCSB, introduced in 2007 as a brand-new translation of scripture by conservative evangelical scholars. Both the original and the revision are considered accurate, readable, and faithful to the text. The CSB eliminates one distinctive of its predecessor: the HCSB used “Yahweh” in place of LORD throughout the Old Testament, though not consistently. 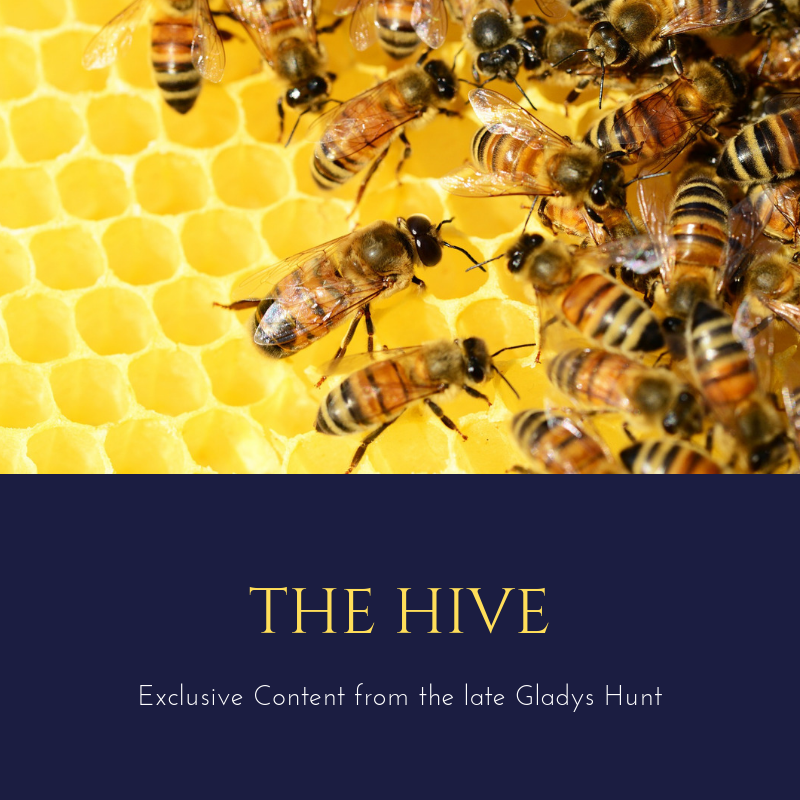 Ten years of feedback indicated that the usage wasn’t helpful, so the revised version drops the Hebrew tetragrammaton for the sake of contemporary readers. Other changes were made for the same reason: the Greek doulos is now rendered as “servant” rather than “slave” (to avoid any association with race-based slavery) and capital letters for pronouns relating to God were dropped. Gender has become a hot-button issue with some Bible translations; though the CSB cleaves to traditional usage, some of the masculine-gendered words, where the meaning clearly includes women as well as men, are generalized: “anyone” instead of “any man,” for instance. For more comparisons between HCSB and CSB, here’s a handy chart. The Big Picture Interactive is CSB’s enhanced children’s Bible. Most of the features from the old HCSB remain, especially the free app that parents can download to a smartphone or tablet (that’s the interactive part). Holding the phone over any one of the 146 full-color illustrations will make the characters pop up for a three-dimensional effect while the story is read. The app gets mixed reviews on Amazon because the user has to hold the device over the picture for the entire time the audio is playing, which may be frustrating for little ones and tiresome for their parents. Some pages are so crowded with features it’s hard to find to text. 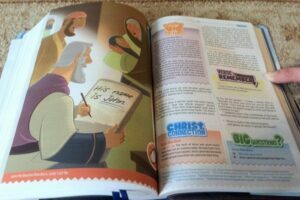 But the features are useful: “Big Words” is like a Bible dictionary folded into the text; “Big Questions” addresses things kids are likely to wonder about; “Christ Connections” points out scriptures, especially in the Old Testament, that point to Jesus; and “Seeing the Big Picture” provides discussion points and overarching concepts. I especially like the expanded Table of Contents, which presents a basic outline of the whole Bible on a few pages. It also helps kids find key stories and characters quickly. Twelve “Big Picture” icons are keyed to major periods and themes in Bible history (they also coordinate with Lifeway’s Gospel Project curriculum). The appendix includes maps, an index to stories, and a very basic (4-page) topical concordance. The large 12-point font is another plus, though it makes for a hunk of Bible to carry around.